Home Upgrades, Is It About Time? If you were to rate the character of your house on a scale of 1 to 10, with 10 being the greatest, how would you rate the overall class and character of your home? Would you say your home is pleasing to the eye, warm or inviting? Or would you say your home is simple and bare at best? If you rated your house anywhere from 1 to 7, it means your house likely needs a few simple upgrades. If you feel your home feels drab or plain, you’d be surprised to know how a few simple home upgrades can make a big difference. CK’s can help you upgrade your home to give it a facelift. This holiday season give yourselves the gift of home upgrades! A few small upgrades can make a big difference in your overall comfort and enjoyment of your home. Here are a few simple upgrades you could consider. Crown in crown moulding is an appropriate word to describe the culminating effect of the transformation of a simple house into a beautiful home. With artistic joinery between the walls and the ceiling, you will be amazed what a difference crown moulding can make for your house. Designed to add greater depth and appeal to rooms, crown moulding can work wonders for plain, boxy rooms. Tasteful and elegant in appearance, crown moulding has become more and more popular in homes of all types and appearances. There are a number of different types, colors and styles of crown moulding to suit your taste and fit the style of your home. 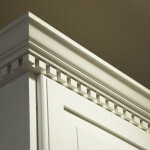 Check out CK’s wide selection of crown moulding for your home. Overall the defining character of a room is often underestimated. A simple paint job adds a new vibrancy to your home, giving it a fresh new look. After many years paint begins to fade, crack, flake off and lose its crisp look. With a new coat of paint to the interior or exterior of your house, you can give your house the facelift it needs. Never underestimate the wonders of a little paint on an old house. Check out local paint shops near you to find the best priced paint supplies available. If you own an older home and have not replaced its windows and doors, it might be well worth an upgrade. Older homes with older windows and doors are not as energy efficient as newer windows and doors, and might plain be out of style. Upgrading your windows and doors will greatly enhance your home’s appearance and energy efficiency. Browse through CK’s selection of windows and doors available. We offer vinyl, aluminum, fiberglass and wood windows to match any style of home you may have. Some often put off home upgrades for a long time in order to invest or save their money in other more important areas for a time. While this is both wise and commendable, some individuals get to a point of financial security and lose their desire to invest in their home. If this could be described of you, maybe it is time to rekindle your desire to upgrade your home and make it a more comfortable living space for you and your family. After all, investing in your home is not just important for you, but it increases the overall value of your home as well. Make your home worth its best value. It can make a big difference in the overall look and feel of your home. Give CK’s Windows and Doors a call today to receive quotes on windows and doors in Idaho Falls. We can be reached at (208) 528-8070.